The world installed 31,100 megawatts of solar photovoltaics (PV) in 2012"”an all-time annual high that pushed global PV capacity above 100,000 megawatts. There is now enough PV operating to meet the household electricity needs of nearly 70 million people at the European level of use. While PV production has become increasingly concentrated in one country - China - the number of countries installing PV is growing rapidly. 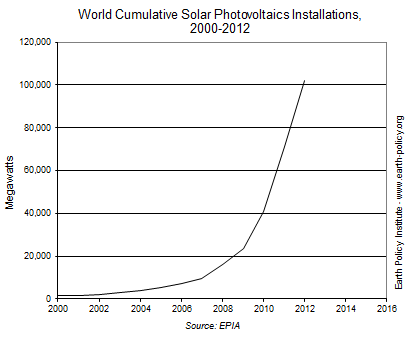 In 2006, only a handful of countries could boast solar capacity of 100 megawatts or more. Now 30 countries are on that list, which the International Energy Agency (IEA) projects will more than double by 2018. Depending on China's 2013 final tally, Japan could well install the most PV this year, perhaps more than 9,000 megawatts. This would give Japan some 16,000 megawatts of solar capacity"”over halfway to its official 2020 target of 28,000 megawatts. Historically, Japan has been the world's leading market for residential rooftop PV; in 2011, some 85 percent of PV capacity added there was residential. After the March 2011 Fukushima nuclear disaster, though, the government introduced a generous incentive encouraging larger projects, thus spurring huge investment in utility-scale PV capacity. The other big Asian solar story comes from India, a country of 1.2 billion people where an estimated 290 million still lack electricity. According to the solar energy consultancy Bridge to India, the country had 1,700 megawatts of PV installed by May 2013, with 80 percent of it in the sun-drenched northwestern states of Gujarat and Rajasthan. Bridge to India projects that figure will jump to 12,800 megawatts by 2016. India's National Solar Mission calls for 22,000 megawatts of solar power nationwide by 2022, including 2,000 megawatts of off-grid PV. Going solar is becoming increasingly attractive in India due to notoriously frequent blackouts and climbing grid power prices - not to mention that solar is now cheaper than diesel for electricity. Even though Asia's PV installations are soaring, it will be some years before it can unseat the European Union (EU) in regional PV dominance. The EU boasts 68 percent of world PV capacity. In 2012, for the second year running, the EU added more PV than it did any other electricity-generating technology. EU countries now annually installing hundreds or thousands of megawatts include Austria, Belgium, Bulgaria, Denmark, Germany, France, Greece, Italy, and the United Kingdom. Germany remains the world's solar capital, home to nearly one third of global PV capacity. For the third straight year, Germany added more than 7,000 megawatts of PV in 2012, reaching 32,000 megawatts. Accounting for some 5 percent of national power use, the electricity flowing from Germany's solar panels in 2012 was enough to supply more than 8 million homes. The main policy driver that has allowed Germany and Italy to amass their world-leading solar capacity is the feed-in tariff (FIT), which guarantees renewable energy generators a long-term purchase price for the electricity they supply to the grid. As these markets mature and solar system costs decline, FIT incentives are being reduced. But worldwide more than 70 countries - the majority of them now in the developing world - use some form of FIT. Renewable portfolio standards (RPS) - laws now in 29 states typically requiring that renewables account for a specified share of the electricity that utilities sell - have historically driven U.S. PV development. In California, the U.S. solar leader, utilities must get one third of their electricity from renewable sources by 2020. Federal tax credits and cash grants are also PV catalysts, as are the increasingly popular arrangements allowing homeowners to lease a system from solar developers like Sunrun and SolarCity rather than footing the entire upfront cost. More than half of U.S. residential systems are now leased. These large projects illustrate another global PV trend: the rise of the mega-project. Only a few years ago, the 10 largest solar farms were between 30 and 60 megawatts. Now PV parks of 100 megawatts or more are becoming commonplace. Arizona's Agua Caliente PV project became the world's largest at 250 megawatts when its fourth phase finished construction in 2012. (It will eventually be 290 megawatts.) Developers have announced a 475-megawatt PV farm in Nagasaki, Japan, due in 2016. Several projects between 500 and 3,000 megawatts are under development in California. 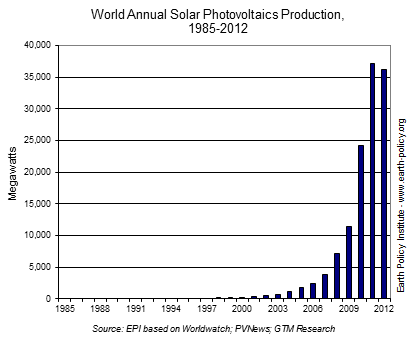 Analysts expect a new PV installation record of 35,000 megawatts in 2013. Even with the possibility that Europe's annual installations will fall below 10,000 megawatts over the next few years, China, Japan, and the United States, along with the growing number of "newcomer" PV countries, will more than pick up the slack. The IEA estimates, perhaps conservatively, that world PV capacity will more than triple by 2018 to 308,000 megawatts - at peak power, the generating equivalent of 300 large nuclear plants. By J. Matthew Roney. For a plan to stabilize the Earth's climate, see "Time for Plan B." Data and additional resources at www.earth-policy.org. World Solar Power Topped 100,000 Megawatts in 2012....This is great achievement...good going, keep it up. I am glad to have read this amazing informative post! You have came up with good information.